A major road closure is scheduled through Temple Saturday night, April 21, and into mid-day Sunday. TxDOT will shut down both north and southbound lanes of I-35 between Nugent Ave to the north and Loop 363 to the south. The closure goes into effect at 8 PM Saturday, when crews will begin demolishing the old Adams Avenue bridge. Work is expected to be finished and I-35 reopened at Noon Sunday. Northbound traffic will detour off I-35 at Exit 300 (57th St/Ave. 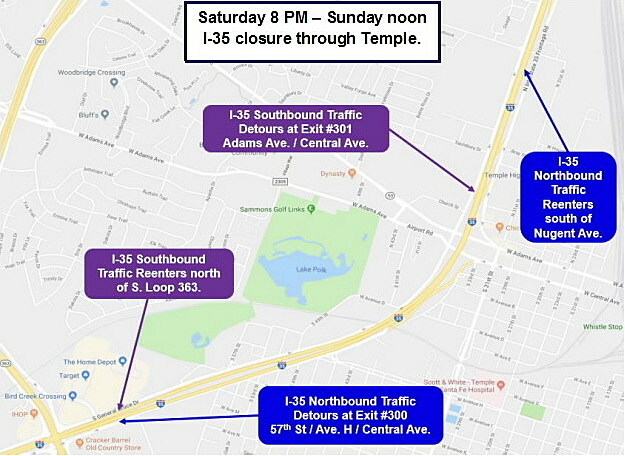 H/Central Ave) and re-enter I-35 between Adams Ave and Nugent Ave.
Southbound traffic will detour off I-35 at Exit 301 (Adams Ave/Central Ave) and re-enter I-35 before South Loop 363. We recommend you take Loop 363 around the area, but if you can't, expect major delays as traffic is directed along the frontage roads. Even if you're just driving around town, expect to hit traffic from travelers having to detour. Also keep an eye out for flaggers and contractors and give them space. Plan your route to to Church or Sunday brunch ahead of time. If you have any questions, you can contact TxDOT's Jodi Wheatley at (254) 867-2836 or Ken Roberts at (254) 867-2705.